When I think of "coastal towns" in this country, my mind goes straight to that mythical place, Cabot Cove, Maine. Even though it's not a real place, the town we saw on television was quaint enough to stick in one's brain. 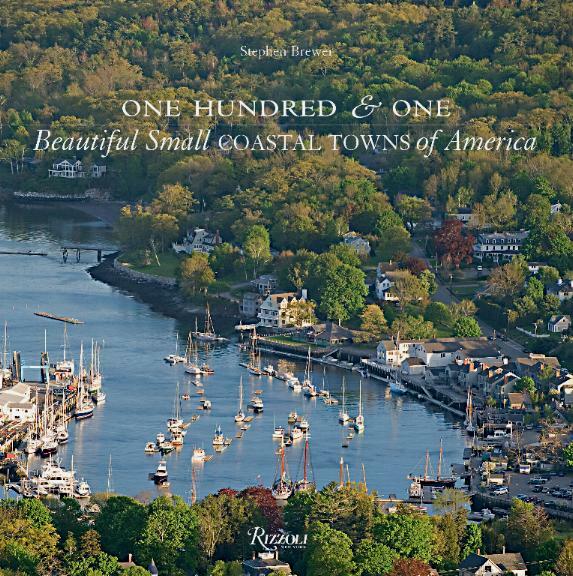 This beautifully illustrated book features many such quaint and in some cases, downright gorgeous towns. Author Stephen Brewer covers these areas: The Northeast (Maine, New Hampshire, Massachusetts, Rhode Island, Connecticut, New York, New Jersey, Delaware, and Maryland); The Southeast and Gulf Coast (Virginia, North Carolina, South Carolina, Georgia, Florida, Alabama, Mississippi, Louisiana, and Texas), and the West Coast (California, Oregon, Washington, Alaska, and Hawaii). So, you've got many places to fall in love with or the difficult task of choosing which to visit, the latter always a lovely thought. Some of the towns vary from retreat resorts for the rich and famous to fishing ports, to spiritual spots to art colonies and more. Many however, offer the most gorgeous scenery, well worth visiting. In the book the history of each place is revealed along with interesting facts, like the granite from Stonington, Maine that was used to build the Boston Museum of Fine Arts, the Brooklyn Bridge, and the Smithsonian Institute. Many are picturesque stops that fuel the artist in people. Whether it's the intellectual, the history, the beauty, the artistry, the literary, the industrial, the solitude, the seaside resort, the scenery, the food or the military or naval aspects you're after, you'll find what you're looking for in this book. The English influence is felt predominantly in the east, the French in the south, and the Spanish in the west, with of course, Native American influence everywhere. Delightful combinations anywhere you visit. Is it Cape Horn or Cape of Good Hope? It's definitely not Cape of Good Horn as it says on page 40! Conclusion - Mouthwateringly tempting to the traveler.